For a while I practically gave up on butter. I wasn’t aware of it immediately, it was a few years later that I realized, with some puzzlement, how indifferent I’d become. When I moved to New York 14 years ago, though I was already very keen on cooking as a means to gather friends around the table, I wasn’t yet too obsessed about daily ingredients. I was busy working and loving it and finding a life in this somewhat intimidating city. I didn’t go out of my way to seek just the right product, except for friends when I would gladly trek to all corners of the city to find the elusive squid ink and fish bones for that black risotto. Day to day, without really noticing it, I just stopped eating certain foods, mistaking and too quickly dismissing industrial blandness for ‘different to what I was used to at home.’ In any case, we went out practically every night. So, among other things, I never bought chicken, and I stopped liking butter. When one day — I don’t remember who or when — someone commented on the transcendent quality of bread and butter, I realized I had stopped caring. How could this have happened? I decided I must right the many years of neglect; I started buying butter from France. This didn’t strike me as terribly sensible, practical, or environmentally responsible, but it was tasty. Until I became attuned to real butter, good butter, made relatively close by in upstate New York, or the Northeast at the very least. At first there was essentially Ronnybrook. Now a number of other butters have become quite readily available, and more seem to appear at the market and in stores every day. Here is a small sampling of butters that are most easily found at markets and supermarkets in New York. 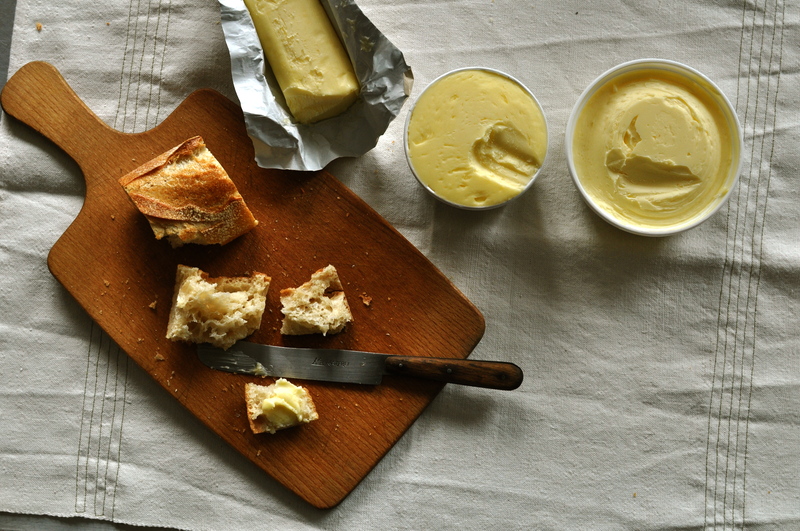 Kriemhield Meadow Butter — the best — is from grass-fed cows, with a high fat content (crucial). It is very tasty and assertively salty. Ronnybrook — old habits die hard — is always in the fridge (we often have three, four, sometimes five different kinds of butter at a time. Ahem.). This one is mild in taste, even the salty version. Good for everyday. Vermont European Style Cultured Butter from Vermont Creamery and Kate’s Homemade Butter are local-ish and definitely better than the average mega-brand, but not all that tasty. Despite all its local-ish, organic, and grass-feddedness, I didn’t much like Natural by Nature’s Salted Whipped Sweet Cream Butter. It has much lower fat content than the other butters, and therein lies the rub. This entry was posted on 24 June 2013 at 16:01 and is filed under Buying local. You can follow any responses to this entry through the RSS 2.0 feed. You can leave a response, or trackback from your own site. 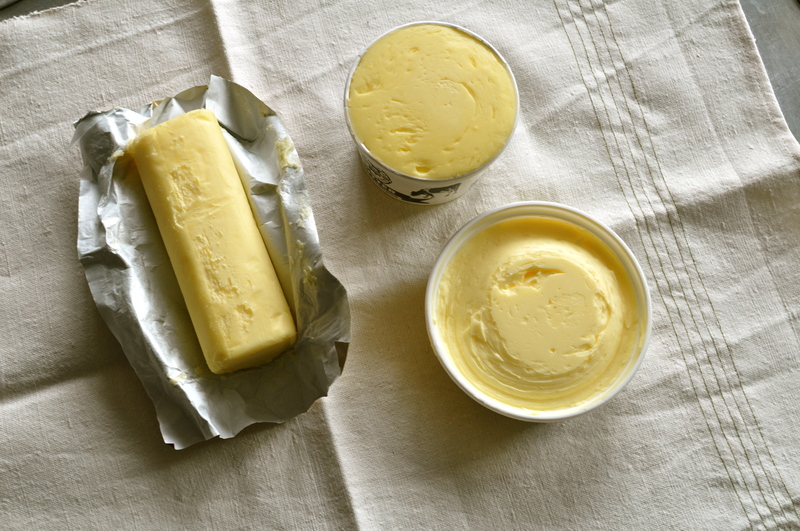 Five kinds of butter in your fridge? I LOVE it! Wonder if I can find Kriemhield in Boston? 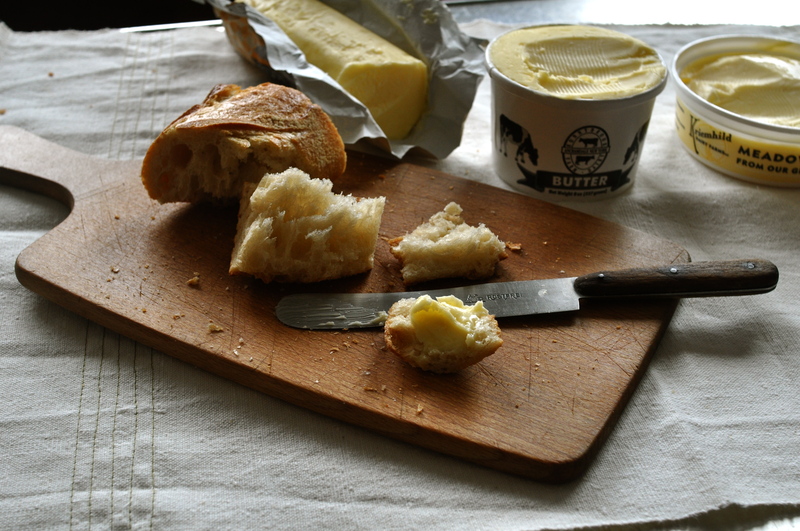 It’s true: good local butter has improved by leaps and bounds. As has bread. But we’re spoiled in New York.